Want to convert YouTube videos to MP3 audios so that you can listen to YouTube music on your MP3 players on the go? Then mediAvatar YouTube to MP3 Converter is a must for you. With this YouTube to MP3 Converter you can download and convert YouTube FLV videos to MP3 audio files or WAV or MP2 audios so that you can enjoy them on your MP3 player anytime anywhere. Additionally mediAvatar YouTube to MP3 Converter comes with a buit-in YouTube Video browser allowing you to browse, search, preview, download and convert YouTube videos to MP3. And you can also browse YOuTube videos in IE browser and download YouTube to MP3 players by drag&drop or copy&paste. Download and extract soundtrack from YouTube videos and convert it to MP3 audio in one single step. 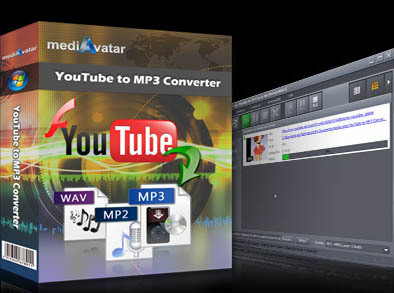 Download mediAvatar YouTube to MP3 Converter for FREE now! It couldn't be easier to download YouTube videos to MP3 players! Download and convert YouTube videos to MP3, WAV or MP2 audio format. Download and convert YouTube videos to MP3 audio directly. Simultaneously download FLV/HD videos from YouTube and convert YouTube to MP3, WAV or MP2 audio, all at one go. Download via the built-in browser, Internet Explorer (IE) right-click menu, proxy, or by dragging and dropping video URL directly to application. Install mediAvatar YouTube to MP3 Converter and you can browse videos on YouTube in IE and download any video by right-clicking on its URL and selecting the download option. Configure a proxy server for downloading videos from YouTube to MP3 players. Download a YouTube video to MP3 player by dragging & dropping its link to the program interface or its "Drop Zone" directly. This YouTube video to MP3 Converter supports multithreading and batch processing, enabling multi-file YouTube to MP3 download and conversion at high speed. This YouTube to MP3 converter's interface is available in English, German, French and Spanish. Switch videos to audio file formats to play on mp3 or other audio players.